JOHNSTOWN, Pa. — On Friday night, natives of Cambria County saw the Johnstown Tomahawks of the North American Hockey League face off against former Pittsburgh Penguins and Johnstown Chiefs to benefit local youth hockey organizations. 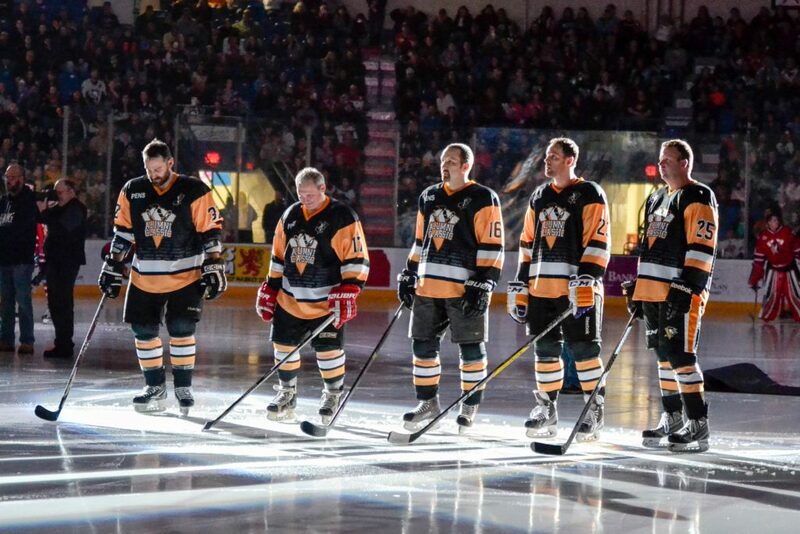 Held at the historic 1st Summit Arena at the Cambria County War Memorial, the UPMC Health Plan Penguins Alumni Classic featured an alumni team boasting several former Penguins and Chiefs legends. The Penguins alumni team included Brian Trottier, Phil Bourque, Jay Caufield, Troy Loney, Tyler Kennedy, Colby Armstrong, Francois Leroux, and Jean-Sébastien Aubin. Christian Hanson, a former Toronto Maple Leaf and son of Slapshot icon Dave Hanson, also participated. Former Steelers kicker Shaun Suisham also laced up the skates, replacing former Penguin Mitch Lamoureux at the last minute. Michael Gosnell, communications manager for the Tomahawks, said the event benefited youth hockey organizations as well as veterans in the Johnstown community. A roller hockey rink was recently constructed in the Roxbury Park region of Johnstown, which he said would also receive funding from the event for upgrades and other features. Gosnell said that while featuring former NHL stars is always fascinating for fans, having players from the defunct Johnstown Chiefs and Jets franchises means just as much. The Chiefs played in Johnstown from 1987-2010 in the East Coast Hockey League, later known solely as the ECHL. The team since relocated to Greenville, South Carolina. and is known as the Greenville Swamp Rabbits. Former Chiefs partaking in the event included former captain Randy Rowe, Jean Desrochers, Josh Piro, Joe Tillari, Jason Spence, and Dmitri Tarabrin. Former Johnstown Jets center Reg Kent also participated in the event. Former Johnstown Chiefs goaltender and current Bishop McCort Crushers coach John Bradley coached the Penguins alumni team along with Kent and Trottier. Bradley’s Crushers just recently captured the PHIL Single-A Penguins Cup. 1st Summit Arena was packed with a sell-out crowd on Friday night, and fans were amazed to see the numerous hockey legends on the ice. Not only were the fans in awe, but Penguins and Chiefs alumni were also impressed with the turnout by the city. Kent spent nine seasons with the defunct Johnstown Jets from 1965-1974. After seeing the crowd on Friday, he was impressed to see how hockey has lived on in Johnstown over the years. Bourque, who won two Stanley Cups with Pittsburgh, addressed the crowd during the pre-game warmups to a thunderous applause. He looked up, amazed at the passion the city displayed. Trottier, who was a seven-time Stanley Cup champion in his hall-of-game and NHL 100 career, could not express his enjoyment for the city enough. The game ended with the Tomahawks defeating the Penguins by a score of 9-5. Rowe, Tyler Kennedy, Dmitri Tarabrin, Jay Caufield, and Christian Hanson all scored for the alumni team.